Athens, GA (Dec 15, 2007) - Back on January 23, 1992, presidential candidate Bill Clinton and his wife went on 60 Minutes for a carefully orchestrated interview to set the record straight about their relationship and President Clinton's failings. It seems that going on 60 Minutes to salvage a reputation and win back the respect of the public is not limited to politicians and Martha Stewart. Earlier this week, New York Yankee Star Alex Rodriguez (pictured left) quietly signed a 10-year, $275 Million dollar contract with the Yankees. It was done under the radar, so to speak, because it happened the same day as the release of the Mitchell Report. On Sunday, December 16, Rodriguez and his wife will appear in an interview with Katie Couric on 60 Minutes. 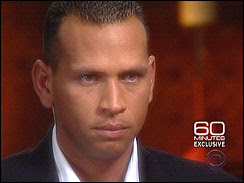 A clip of the interview, played on ESPN Gameday today, had A-Rod's wife saying he was too depressed to eat the day after he opted out of his contract with the Yankees. John Stashower said the clip was enough to make him puke. Katie Couric would not exactly be the first choice of many people for a hardball interview. It will be interesting how many soft questions she lobs at A-Rod and his wife. 60 Minutes is scheduled to air at 7:00 PM EST, football cooperating. This normally should not be an issue because CBS does not have the NFL doubleheader this weekend. However, some markets on the East Coast are scheduled to get the 4:00 PM game. You can see a short excerpt of the interview on the 60 Minutes web site. (Opens in a new browser window).